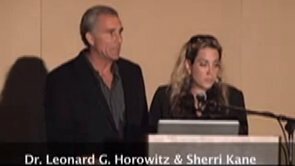 Leading American activists Dr. Leonard Horowitz and Sherri Kane, heavily targeted by CIA/FBI/NSA COINTELPRO, explain precisely how mass mind control is actualized through the media, both mainstream and independent. Having “learned the hard way” how agent provocateurs use cyber-stalking, hacking, and Internet publishing to harass, libel, and discredit targeted “dissidents,” Horowitx and Kane explain their persecution and amazing revelations. They have not only pulled the veil off of the conspiracy industry, but figured out how activist organizations are infiltrated and undermined to maintain the geopolitics and economics of the status quo controlled by the global elite. Tell others about this revealing video.